The Florida wind season has finally started! Last week we had three days of wind 20 then 25 then gusts to 30! The Boynton Inlet went from 3 foot to 6 then 8 foot waves! Today we have 21 to 25 northeast winds, wind forecast to increase all week! I am out of commission due to sciatica. I hope I will be better in another three months and can sail before the season is over. Yeah, sciatica is a tough one, going from heel to shoulder blades, almost debilitating you. I"ve had it one on either side, back in the early '90's, when I was young and strong. Only accelerant for healing times is regular light stretching, some ice, and some ice baths. Here in NorCal, we can replace ice baths with surfing, since the ocean water's are 55 in the summer, and 51 most winters. We just use a worn out 4/3 wetsuit, and freeze our butts off for an hour. Most go outs requiring at least 60 duck dives here at OBSF. I saw you sail up, and I was thinking, "Where'd that guy come from?" That was a really fun day yesterday. I sailed 4.8/99 the whole time although, it was quite a bit windier at first. Most went out on 4.7s, and some rigged down to 4.2/4.0... pretty good size crowd, too. Glad to see everybody still sailing this late into the year. Yeah, that was me. The ride, despite the size of the board, was pleasurable. Can't say enough about the new school of really short, really wide and thin, bigger boards (volume wise) that are coming out. They plane quickly, turn well and feel small so you don't feel like you're getting beat up in stronger wind and chop. Also, they are easier to uphaul and tack should the conditions require it. Been real happy to add this board to my quiver this past year. Third turned on early Saturday, lulled, and then turned on even more. Depending on your timing, it was either epic or total crap. For me, 4.7 with 85 liters and then same sail down to 75 liters (on a flood no less) was plenty. Good shoulder high ramps in the channel didn't hurt. Sunday was deceptive. It looked real sketch and cloudy. 94 liters and 5.2 turned out to be just enough to work. Wind was kind of WSW, which had us pointing straight up at the Bay Bridge. Getting back was fun bobbing past all the downed kites that couldn't re-launch in the SW conditions and near zero wind inside. Again depending on timing and gear choice, it was fun or total crap. Sailed Natural Bridges today with my new SUP/Sailing board, an Angulo 10'10". I had sailed it in light wind and found it handled that well. I SUPped yesterday cruising the coast and riding waves at Bombora. Handled great. Good glide and tracking. Takes a bit to get 'er to turn, however. Today I took snorkel gear out on it back to Bombora to see if I could find the sunglasses I lost yesterday. No such luck. However, the leash ties nicely to kelp and the gear road out and in well on the back with a line tying it to the leash attachment loop. So today it was blowing about 16 to 20 knots at Natural Bridges so I thought I would see how it handles real wind. It did great. I used a 7.0 Ezzy Cheetah and the Angulo planes instantly. Try to get it not to plane. That would be difficult. A few times, especially at twenty knots, it would have been nice to have had footstraps, but it handles pretty well without them. So in all three aspects, SUPping, Light Wind & Strong Wind, the Angulo was fun and I am glad to have it. Very light today, but it's all practice to me, so all good. 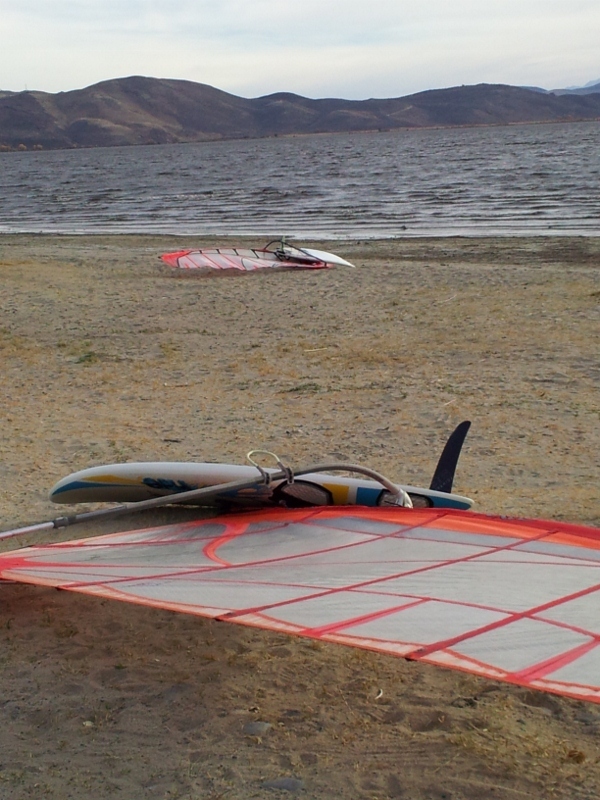 I was the *only* windsurfer at any level from 2-4, although a guy was turning up when I was leaving. Very warm though; enough that you want to deliberately spend some time in the water. Sailed for a couple of hours this afternoon off of Natural Bridges. The Angulo 10'10" SUP/Windsurfer. With the Ezzy 7.0 Cheetah. Winds 12 to 14 mph. So mid speed winds. Again the Angulo handled well. Beside back and forth trying to find some swell (I did get to ride one), I sailed downwind to Mitchell's Cove and then tacked back up the coast to Natural Bridges. The tri-fin set up seems to go to windward. And it was comfortable sailing straight downwind. I am over 190 pounds.